Last weekend I've downloaded both Mandriva 2005 LE DVD and Fedora Core 3 DVD and installed them on my spare pc. Problem was that I only had 1 SCSI HD and when I installed the second Linux distibution, its loader did not recognize the other one. So, below is how I tinkered with grub and finally made it work in anyway I wanted. I posted an e-mail to Mandriva expert group and asked for help. Someone extended his handed and suggested that I copy Mandriva boot files into Fedora boot partition and add an entry for it in the grub. I did it and it worked. Below is from my e-mail to the grup but note that boot loader application 'grub' does not care if you have an ide or scsi. First harddrive will be shown as hd0 (not as sd0 as one might expect). could not go back to Fedora as it did not know anything about Fedora! setup (hd0) loads grub into MBR (Master Boot Record) so that it will run next time I boot. After rebooting, I am back to Fedora. This notation seems to be specific to my installation and Grub. Lilo does not recognize it as a valid root (/) partition. Plumber - MovieThis is a fun movie! I fixed my connection problem by choosing "No Proxies" instead of "Firewall with no proxies" which used to be my default in the previous version. The new build number is: 7,0,0,242! Yahoo! Messenger Beta is available for download from Yahoo. I tried it but seems to have some connection issues. I checked Yahoo's page. Apparently there is a page for those people who are having connection issues with Beta but guess what. It is not accessible: "The requested URL /pager/download/beta/more.html was not found on this server." I found out about this cool web site called Google-Traffic.com . 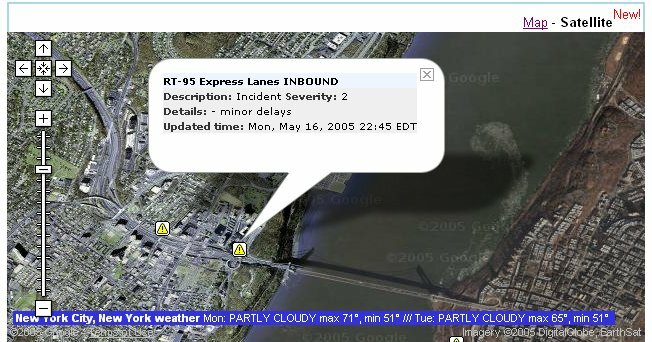 Apparently, someone found yet another useful way to hack Google Map to display Traffic & Weather info on it. In fact, you can also display such info on Yahoo Maps too. Pretty neat trick! Scot's Newsletter | The Best Of | Customizing Firefox I'm posting this for my own reference. Scot has a nice list of customization on this web site. I am also a subscriber of his monthly newsletter. Check out this month's issue here and if you like it you can subscribe to it here. Wow. My site took the greatest page hit when I posted the issue I discovered with Google Web Accelerator. I stopped using Google Web Accelerator since then. I learnt about a vlog site called Rocketboom. They have 3mins long funny vlogs everyday. Oh, do not forget to check out yet another histerical 'numa numa' video. OK, it's been a few days since I installed Google Web Accelerator . I have not had a chance to use my pc much but it claims that it saved me 1.9 mins. You may ask, 'hey I already have Broadband! Why would I need a web accelerator?'. My answer would be 'If you are asking that, you probably do not need it'. War Nerd - Glory to the Turks!